Today & tomorrow – live webcast – Standards for Microbiome Measurements @NIST – microBEnet: the microbiology of the Built Environment network. This workshop will seek input on defining reference materials, reference data and reference methods for human microbiome community measurements. 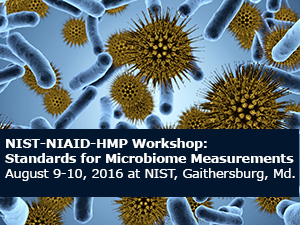 This workshop is sponsored by NIST and NIH’s National Institute of Allergy and Infectious Diseases and the Human Microbiome Project. Over the past 10 years, advances in ‘omic technologies have resulted in a meteoric rise in our ability to understand the constituents and functions of complex microbial communities (microbiomes); and the profound effect that these microbiomes have on their hosts and the environment. However, the interlab comparability of measurements on microbiomes is generally poor. Biases exist along every step of the measurement process, from sample collection, extraction techniques, measurement technology employed (next-generation sequencing, mass spectrometry, nuclear magnetic resonance), and, finally, to data analysis and interpretation. There is a need for the adoption of reference materials, reference data, and reference protocols in order to identify and eliminate measurement bias.